This is an excellent study of the highly complex historical trajectory of political life in Tripura. 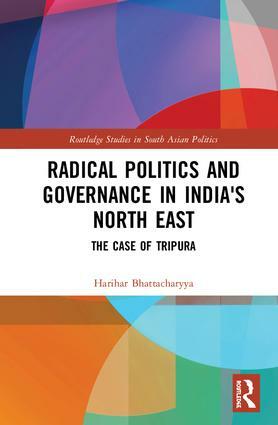 Its distinctiveness lies in the fact that it analyzes Tripura's radical politics in the broader context of the general dominance of the politics of ethnic identities in India’s Northeastern region. Based on an interesting methodological combination of archival-historical research and empirical ethnographic observation, this study offers a nuanced and complex understanding of the paradox of the remarkably durable electoral success of a Left party in a region dominated by identity-based mobilization. Professor Harihar Bhattacharyya is the most distinguished Indian political scientist working on Tripura. This volume provides a rich and informed understanding of radical politics in a state and region that has been neglected by mainstream specialists for too long. Professor Bhattacharyya is to be commended for his painstaking effort in challenging the conventional assumptions about Tripura and the north-east region. A must-read volume for all those interested in radical politics and the governance challenges facing the north-east states. Harihar Bhattacharyya is Professor of Political Science, University of Burdwan, India. He has published extensively on aspects of Indian political processes and institutions, comparative federalism, social exclusion, citizenship, ethnicity and nationhood. His recent publications by Routledge include Federalism in Asia: India, Pakistan and Malaysia (2010), The Politics of Social Exclusion in India: Democracy at the Crossroads (co-edited, 2010) and Globalization and Governance in India: New Challenges to Society and Institutions (co-edited, 2015).